Sometimes, you may wish to change the GPS location on your iPhone, to perform a spoof check-in at a faraway place, unlock special Snapchat Geofilters, or for whatever other reasons. Usually, doing this would require you to jailbreak your iPhone, but in this article, we’ll demonstrate how you can indeed fake your GPS location on a non-jailbroken iOS device. Now if you’re skeptical about this location spoofing mechanism, there’s no need to worry. What we’re doing here, is leveraging the location simulation option provided by Apple, primarily meant for developers. Update: The following method for spoofing geolocation no longer works for iOS 11 and above. And a feasible workaround for the same is yet to be explored. But depending on your specific requirement for geolocation spoofing, a possible solution might be available. For example, if you’re looking to use location spoofing to a fake location in Pokemon Go, or for accessing certain location-specific Snapchat filters, there are tweaked versions of these apps — Poke Go++ and SnapChat++ — already available for non jailbroken devices, via BuildStore. You can learn more about the respective workarounds in the below articles. Alternatively, if you’re looking for geolocation spoofing for a different purpose, let us know in the comments below, and we’ll try to help you. If you’re an iOS developer building an app that works only in specific locations, you should be able to test the app from anywhere in the world, regardless of the its geo-restrictions. To get around the problem, Apple provides a way to override iOS Location Services from within an app, allowing you to test your app as required. Once this is done, however, all other apps using Location Services on the same device, will use the simulated location as the current one. And you can use it to check-in on Facebook, share it on WhatsApp, or do whatever else you want to do. Note: This article explains how to spoof/fake your geo-location (GPS) on iOS devices. If you’re looking for a way to hide your Internet activity, or want to access geo-restricted content instead, you need, what is called, a VPN service. You can check out our dedicated VPN guide here. As mentioned above, the option to simulate location on iOS devices, is only available for the developers. But there’s an easier way, which involves modifying a Property List (.plist) file, associated with the native Maps app for iOS. Once the required property has been modified, the option to simulate a custom location will be available within the iOS Maps app. So, how can you modify the preferences file of an installed app, without jailbreaking the iPhone, iPad or iPod Touch? You can’t; well, not at least directly. Instead, you could take a backup of the device on a computer, update the backup with the required changes, and then restore the modified backup back to the IOS device. For this, you need a software that enables you to read and edit iOS backups, and also lets you restore them. 3uTools is one such advanced software for Windows PCs, and the app can be downloaded for free from their official website. You can use any other app that provides similar functionalities. Note: To access iOS backups, these tools usually need iTunes to be installed on your computer. The below steps will guide you through the steps to simulate a custom location on your iPhone, iPad or iPod Touch. Download and install 3uTools for Windows. When the backup process completes, go to Backup/Restore >> Backup Management and select the latest backup, and click on the View button at the bottom right corner. 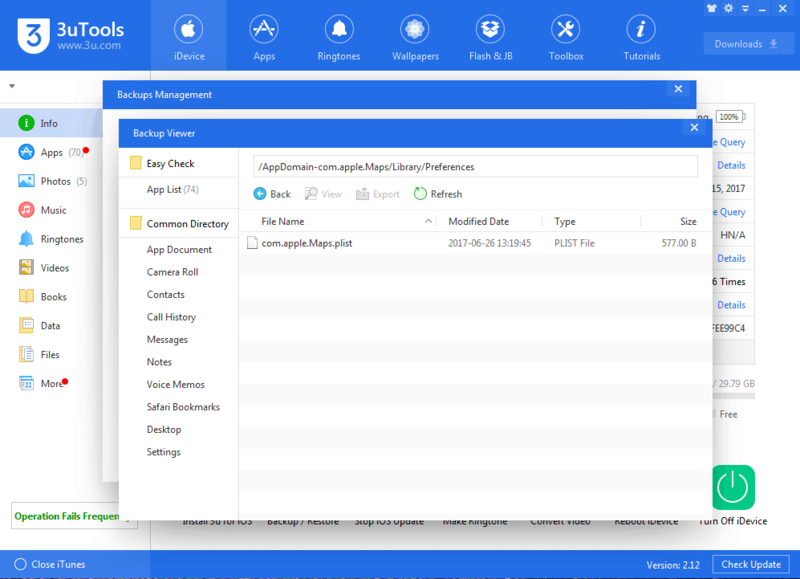 In the Backup Viewer, click on the App Documents tab and navigate to AppDomain-com.apple.Maps >> Library >> Preferences folder. 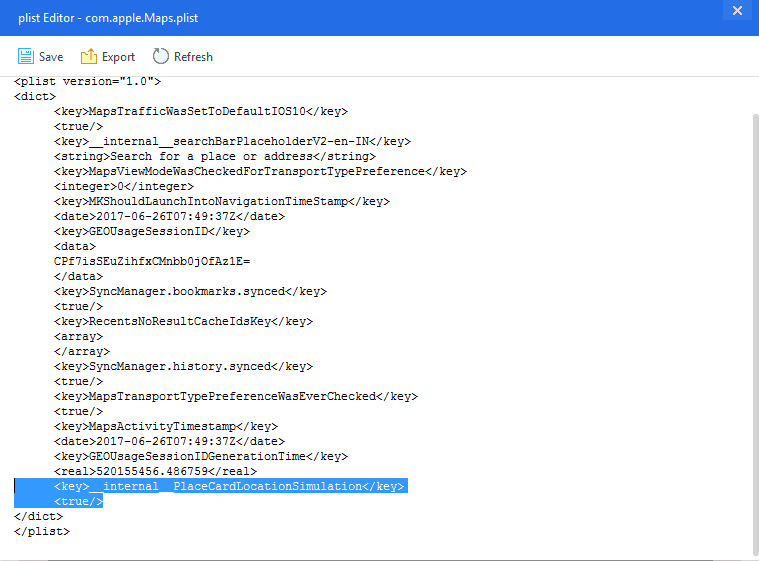 Now, open “com.apple.Maps.plist” file by double clicking it. The file opens in a plist editor. Ensure the proper alignment and save the file. Now go back to Backup/Restore and choose Restore Data. Wait for the restoration to complete, and unplug your device from the computer. 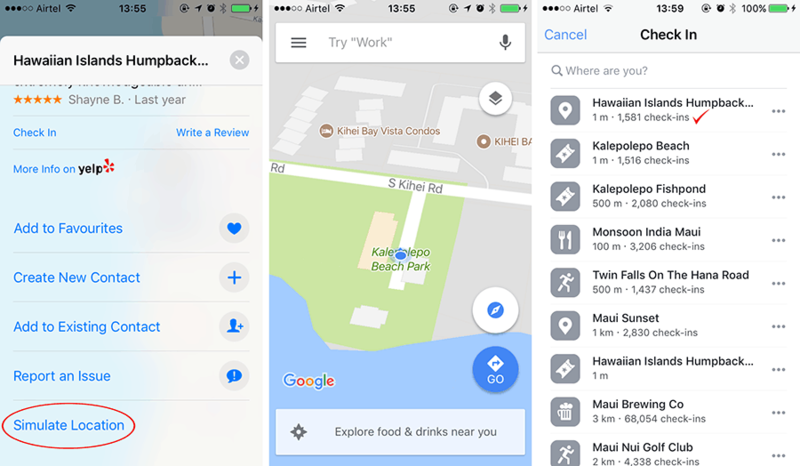 Now launch the Apple Maps app on your iOS device, and search for the particular location you want to simulate. Once the location pin is set, scroll up from the bottom. You should find a “Simulate Location” option at the bottom of the screen. Tap on it. Your preferred location is now simulated across all apps using Location Services. 3uTools is only available for Windows PCs at the moment. If you have a Mac instead, you can use any other similar tool that allows you to view, edit iOS backups, and lets you restore them to your device. iBackupBot is one such example. Alternatively, if you’re an iOS developer familiar with Xcode, you could use this guide to build an app with location simulation. Update: This method no longer works for iOS 11 or later. We’re exploring possible workarounds at the moment and will update the article as soon as we have a solution. In the meantime, developers can simulate location in their apps using Xcode, for testing purposes. So, you’ve had fun simulating a fake location and exploiting it for fake check-ins, unblocking Snapchat Geofilters, and so on. And now, you want to revert back to the actual location on your iOS device. For that, you need to restart your iOS device, or if preferred, restore to a previous backup using iTunes. After the device restarts, the location services will indicate your actual current location. If you know of any other methods to simulate location on iOS devices, let us know in the comments below.